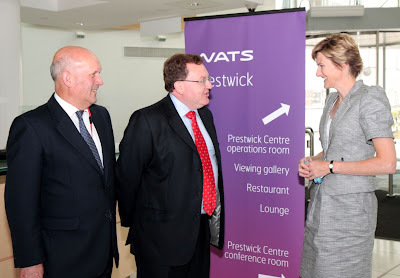 Scotland Office Minister David Mundell MP has paid a visit to Prestwick’s new Air Traffic Control Centre, where, along with local MSP John Scott, he met with the Centre’s operations director Pauline Lamb and other staff members to learn about the work undertaken at the Prestwick centre. Speaking after his visit, David Mundell said: “There is no doubt that the Prestwick centre is a fantastic facility, and it was fascinating to meet and speak with so many air traffic controllers and other staff members who are responsible for handling just under half of the UK’s air traffic in controlled airspace. There are currently 744 Ayrshire business stories permanently archived on this site. To locate those of most interest to you, please use the site search facility in the top left hand corner of this page. Type your search term in the white box, then click the magnifying glass symbol.